PETER GROVES is Priest in Charge at St Mary Magdalen, Oxford and Lecturer in Theology at Worcester College, Oxford, UK. - Publisher Grace is the first in a series of books on 'serious theology for a popular audience' which will explore key aspects of their belief in clear, accessible and attractive language. The volumes in this series will mostly have one-word titles, words that are commonly used in church. - the Protestant view: Humankind is so sinful, we can do no good at all. To set a great imbalance right, this volume explores what grace is; how it flows from an understanding of the Trinity; how it becomes visible in the life of Christ; grace in creation, human freedom and the Church; ways of thinking about grace and living the life of grace. 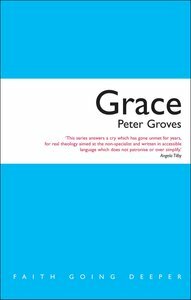 Grace is the first in a series of books on 'serious theology for a popular audience' which will explore key aspects of their belief in clear, accessible and attractive language. The volumes in this series will mostly have one-word titles, words that are commonly used in church.